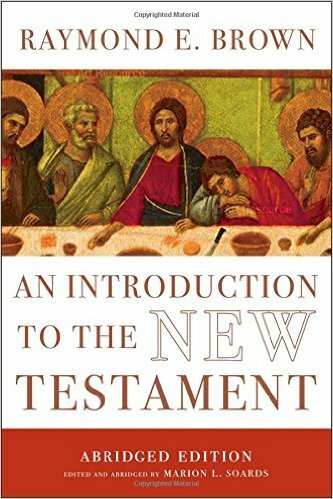 When I am asked to recommend an academic introduction to the New Testament, I usually point people to Fr. 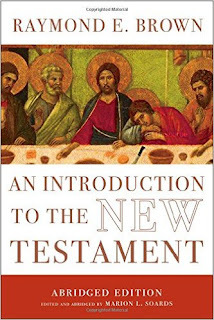 Raymond Brown's Introduction to the New Testament. One of his last works before his death, I have found his original volume to be one of the best books of New Testament Catholic biblical criticism available. It is one book that I have gone back to often over the years. With that being said, I was happy to recently see that a new edition of Brown's work by Yale University Press. This work has been edited and abridged for publication. The Amazon listing does provide a "Look Inside" if you want to compare it to the original edition. This new edition was released on April 12, 2016. Ah yes. :) I got thrown off because it isn't in stock currently! Very good. Thank you. which has some new stuff from the abridging author. They are both IN STOCK at Yale University Press from whom I bought directly on their website about 15 minutes ago this morning. I cannot imagine why anyone would want an 'abridged edition' of ANY book. Well...maybe the novels of Victor Hugo, those could always use some judicious trimming, but that's about it. I heard that Raymond Brown's introductory book shows a doubt on the perpetual virginity of Mary. Is this true? Fr. Browns scholarship casts doubt on everything. He uses an intense and hardline historical critical method in his scholarship. Atheists are also huge fans of his scholarship. So remember when reading his works, he was loved by atheists and Muslims, and opposed mostly by other Catholics and some conservative Protestants. For Fr. Brown, the question of St. Matthew the Apostle being the author of the Gospel of Matthew is obvious - an obvious no. St. Matthew didnt write a word in Fr. Browns mind. "Fr. Browns scholarship casts doubt on everything." It did and then it didn't. He was a master of a kind of theological doublespeak where he would present a long list of arguments why a particular Catholic doctrine was historically wrong, or why it couldn't be rationally defended or whatever, and then at the last second he would pull the rug out from everything he said and claim to affirm all of the doctrines that he seemed to be arguing against. The classic modernist ploy. Fr. Brown had to do it like that, otherwise he would have been labelled a material heretic and his scholarship would've been censored. He was a highly intelligent man and knew exactly what he was doing and knew exactly how to push his critical methodology to the brink without going over the edge into blatant heresy. I am not saying he was a horrible man, or that you shouldn't read his scholarship, or that I think he's in hell - I believe he was a good, holy, devout Priest. I believe his scholarship is good to read if you are up to it academically. I believe personally that he's either in heaven, or being purified and on his way to Heaven. But I am just calling a spade a spade. His scholarship was NOT patristic, it was NOT traditional, not even in the least. And it was only orthodox in a very broad sense, it bordered on heterodox at every sentence, he was always on a tightrope with heresy to the left and apostasy to the right, but he was talented enough to walk that rope and never fall - at least not publicly. I would recommend someone have a good sense and have read both the entire Bible and the entire Catechism, have been a solid Catholic for at least 5 years, have some knowledge of Patristic and Thomistic theology, have a good grounding in orthodox Catholic beliefs and traditions.... I would recommend one have all those criterion met before delving into Fr. Browns work, because Fr. Browns work is certainly capable of not only scandalizing someone's faith, but even helping them lose it entirely if they can't separate what's purely Fr. Browns scholarly guesswork and what's the traditions and Traditions of the Church. I remember reading an interview with Fr. Brown back in the pre-internet days (1992) where he discussed how he could affirm doctrines like the Virgin Birth and the Trinity when his scholarship so effectively undercut the biblical basis for those doctrines. And his answer was: because he affirmed the infallibility of the Church. The Church was infallible and had defined those doctrines, therefore they were to be believed. I walked away from the article thinking, "his faith in the Church is what gives him the freedom to be such a strong historical-critical scholar." Later, as I was thinking more about the interview, it struck me that there was something else at work: the divorce of biblical studies from systematic theology. This is a major concern in modern Catholic theology (something Fr. Barron, for one, has commented on). At Vatican II teaches, the Bible is the "soul of the theology." Separating the Bible and what it teaches from what the Church teaches is quite wrong -- and if I was to point out the biggest concern I have with Fr. Brown's methodology as a Catholic scholar, it is that separation. Very bad idea.